Editor’s note: This is the eighteenth installment in a series of dispatches from the Rath family (Colin & Pam, daughters Breana, Mariel and Nerina), who departed Stamford, CT in the fall of 2014 for a worldwide cruise aboard their Hanse 545 Persevere. You’ll find previous articles linked below. We departed from Tahiti at our usual time in the afternoon for yet another full moon sail with 12 knots of trade winds on our beam to Bora Bora. When we sail these voyages from island to island, it never ceases to amaze me that there is no one out there. No boats, even in the shipping zones around the world –once you are in the ocean you are on your own. Rarely does another boat pop up on AIS once you’re 10 miles from shore. You might see a fishing boat 15 miles off or a freighter on AIS, but rarely visually at all. I still do sleep on deck and wake every 45 minutes through the night, but mostly to admire the starry nights of shooting stars and following seas. This is the ocean I am talking about. The Caribbean, Med and English Channel are a whole other story of multiple targets that you have to watch out for, while the Pacific Ocean in particular is a lonely place out there. That’s the beauty of it and the precarious nature of the ocean. This is the place in the world you have only yourself – and what you bring aboard – to rely on. There is no West Marine in any port. You might find the basics: oil, or a bolt or two, but that’s it. Spare parts are worth their weight in gold out here. It’s quite common to run into other cruisers stranded in some harbor in the Pacific, waiting for parts. We’ve come across at least 20 stranded for parts in our travels so far. Some just put their boat up on land, fly home to get the part, and return next season. Others just wait – some up to six months – for the part to arrive. We have been lucky and I made sure we had doubles of everything before we left, and we still have a lot of spares. Plus our boat is in excellent racing condition and only four years old…knock on wood…so we have been able to keep on sailing without much difficulty. We had some problems with our water maker, generator, boom gooseneck, and actuator, but taking them apart and rebuilding them with the spare parts we had aboard, often with some tweaking here and there, all worked out in the end after some frustrating days of work. All in all, as I said we have been lucky. 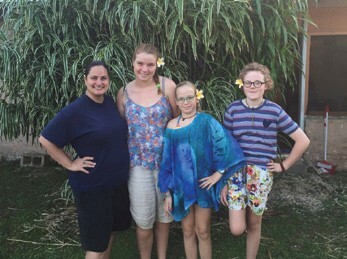 We arrived in Vaitape at dawn with the girls well rested to explore another island after making it through Passe to Ava Nui, the only entrance through the reef surrounding Bora Bora. We picked up a mooring ball at MaiKai Marina, a little outside Vaitape. We went ashore and checked out the town. Bora Bora was set up for a month-long celebration of tribal dances that begins in June each year and culminates with Bastille Day. There was a series of thatched restaurants and booths set up in the square, and nightly dance competitions. It is a carnival type atmosphere with cotton candy and a lot of kids. The girls got into it and we enjoyed the ritual dances. The big event on Bastille Day was a bicycle race around the island, a mini Tour de France, French Polynesian style. There were a lot of scooters racing ahead with spare tires for the bikers for when their tires pop, and a lot of fun and rivalry among the participants…good old fashioned French entertainment. 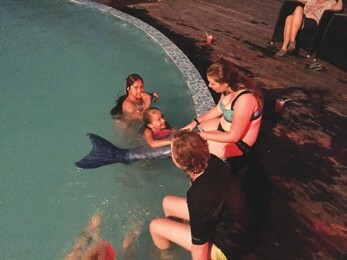 Meriel and Nerina befriended Kihia, the daughter of the owners of MaiKai Marina. The owner was a French chef that married a Californian woman named Donna and had a daughter. The girls hit it off right away and they liked the pool at the marina because it had an infinity edge. While we were exploring Bora Bora over the next few weeks they must have had four or five sleepovers, either on our boat or their house, and they had a blast. Donna had a “mermaid tail,” something like a wetsuit stocking that holds your legs together with a mono fin on the end. They spent the days taking turns swimming with it. The marina owners are very nice people who bought the facility a few years ago and are making a go of it. They are doing pretty well, and it was good to see people taking a chance on a new life and succeeding. We rented a car and toured the island, enjoying a lot of great diving with manta rays and discovering secluded coves in which to anchor. We exchanged burgees from Chautauqua Lake Yacht Club with Bora Bora Yacht Club for my friend Kirk Kelly, CLYC Commodore, who had made me their ambassador to the Pacific. Now, CLYC can put the BBYC burgee up at their clubhouse in upstate New York to give it some international flavor. That was fun. After two weeks, it was time to move on again and we had to get stores for a five-day sail to Niue. We said our goodbyes to new friends and set sail at our usual time. Niue is an upthrust coral reef of about 100 square mile in the middle of the Pacific. The whole country has a population of 2,000. Niue has amazing diving caves and chasms dotting its coast. Some say Niue has the best diving in the world because of its clear water. Since it’s a rock, there are not many beaches or landing areas, just little coral coves and one cement pier at the capital, Alofi. We arrived at dawn on the sixth day, after another uneventful crossing with following seas…although we did catch a tuna. Before you get there you join Niue Yacht Club, “The Biggest Little Yacht Club in the World” (nyc.nu). The club has 16 moorings for visitors that you pay for while you stay, and they pick you up at the dock and help you through customs. There is really no protection except the island and the bay is rather large, so you want a good hook. Because if the wind changes, it blows, and your boat is gone. The seabed is coral and 30 meters down, and after that it goes to 1,000 meters, plus the tide is three to five meters. Anchoring is not a realistic option. Now the fun part of landing at the dock. Since Niue is in the middle of the ocean, the sea can be rough and landing on a cement pier as your dinghy goes up and down five feet with a family of five is a trick to say the least. First, always bring separate clothes in a drybag, and be ready to grab the railing on the cement pier and hold on for life because a second later the dinghy will not be there. Once you get everyone off, you have to hook up a sling and hoist your dinghy onto the top of the pier, then onto a cart, then put the cart next to all the other tenders on the pier, then set up the hoist for the next arrival. This is the only way to get ashore. All boats are lowered in and out by hoist. Even large 30-foot fishing boats are put in and out this way every day, since there is no protected harbor. When a container ship brings supplies, they lower a launch that takes one container at a time and it is hoisted up one at a time ashore. It takes three days to unload a ship. It’s quite a process to watch, and the whole country comes out to help and receive their goods. Once we got organized ashore with customs, we set out to enjoy lunch and plan our exploration of the island. Look for updates on Persevere’s journey in future issues of WindCheck. You can track the Raths’ progress on their Facebook page, “Persevere60545.” Colin’s book, It Is What It Is, can be purchased on ColinRath.com or at Amazon.com or any major bookstore. Look for his next book this fall.